This tutorial will review the process of creating a new Article on your Drupal website. Such are used for time-sensitive content like news, press releases, etc. First, you need to log into your website as administrator and click on the Content from the main menu. Access the Content Manager and click on the Add content button at the top of the page. Title: Enter the title of the new article. Tags: Enter the tags for the new article. Body: Enter the body of the new article. Image: Upload an image for the article. Click on the Save button to keep the changes. Access the Content Manager and click on the Edit button next to the article you wish to edit. Make your changes for the article and click on the Save button to keep the changes. Access the Content Manager and check the article that you wish to publish/unpublish. 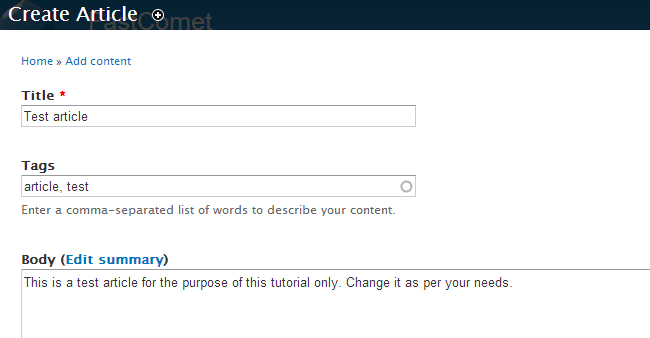 Select the Publish selected content or Unpublish selected content from the Update Options field. Click on the Update button to change article’s status. Access the Content Manager and check the article that you wish to remove. Select the Delete selected content from the Update Options field and click on the Update to remove the article.